My name is Christine Atkinson and I was born on the 6th of June 1945 in the county of Durham. Before I converted to Islam Ahmadiyyat I was a Christian. My mother and father were christened but they weren’t practising Christians. My father’s side of the family were all Catholics and my mother’s side of the family all belonged to the Church of England. It was my Grandmother who spoke to me about God and who also encouraged me to go to Church and Sunday school with her. It was her who really had a strong love for God and who really encouraged me to believe in God through my youth. So I continued to go to Sunday school throughout my childhood. In my mid twenties, I met and later married, my husband Bilal in a church ceremony. We had our first son Martin who was also christened in Church. So I started to take my son to the Church and Sunday school. I used to also teach in Sunday school. My brother Stephen was my son’s Godfather. He was epileptic and he once had an epileptic fit in the Church. The Vicar at the time wanted to move him to the back of the Church out of the way. This upset me greatly because the Vicar thought it was disturbing other people and the Bishop, who was also present, couldn’t get on with his duty. After this incident my husband Bilal wouldn’t go to the Church with me anymore. That’s when he started looking into Islam through his friend Dr Khan. My husband used to go to meet with Dr Khan, but I never met him for a long time. I just carried on going to the Church as normal. But during all this time I constantly had a dream about a white lady. The dream was that the white lady started at the bottom of my bed and over the years she came nearer and nearer to me (I used to have the same dream constantly) and only appeared to me to be a white glowing shape. I never saw her face but I knew it was a lady. It was always glowing and brilliant white. Eventually over the years it came closer to the side of my bed and bent over me so that it was nose to nose to me. I then became aware that it was actually a face of a man. This really frightened me because all the time that I used to have this dream, I would wake up screaming, as I used to believe it was a sign that I was going to die. When my husband Bilal decided he wanted to convert to Islam, as I was a Christian and my husband was now a Muslim, so I sat down my son and told him that I can’t say that his father’s religion is wrong or mine is wrong; therefore if he didn’t want to go to church anymore, then he didn’t have to. But I stressed that I would like him to continue with his prayers. I started to attend the meetings that Dr Khan used to hold in his converted garage (he had made his garage into a hall) because it was a part of my husband’s life and I wanted to be supportive of him. This is how I met Dr Khan’s wife, Mrs Sajida Khan. Soon we became good friends and we used to talk about various topics and eventually we started to talk about Islam. After some time Mr and Mrs Khan invited us to go and meet Huzoor (Khalifatul-Masih Rabi) in London. When I met Huzoor I found out that he was the man who I had been seeing in my dreams. Before I met him I was really nervous because I knew how important a Khalifa was and how people from all over the world used to write to him for prayers and that he was a very busy man. I started to shake before I went into his office. But once I got into his office, I was shocked because he was the man who was in my dreams! I related to him about my dreams. He told me that when the shadow bent over me that was where my heart was and that was God’s way of telling me what He wanted to do. He said that he could see I was shocked and that I needed to think about these things. He advised to go away and think about what he had said and that it was up to me now to decide what I was going to do. Quite some time later we worked out that my dream had started when Huzoor had left Pakistan and come to live in the UK. From the time I told Huzoor about my dream to this very day I never had the same dream again. Whenever I met Huzoor, he always asked me how I was and he took a great interest in what I was doing. He made me feel that he was genuinely concerned about me. He never once asked me whether I had made up my mind about converting to Islam. Over the years we attended many Question and Answer sessions with Huzoor at the London Mosque and Huzoor always had a warm welcome for us. Huzoor also had a very special bond with the Hartlepool Jama’at calling it a ‘pool of hearts’. On one of his visits to Hartlepool, Mrs Khan asked him if he would speak to the ladies. I was invited to join the other ladies and he asked if anyone wanted to ask him a question. So I asked him, “In the Bible Jesus says that the greatest commandment is ‘to Love the Lord your God with all your heart and with all your soul and with all your mind’. If you are doing this to the best of your ability are you on the right path?” He replied, “yes“. After he had left, Mrs Khan told me that when he answered my question with a ‘yes’, her heart sank because she thought that now I would never convert to Islam. As I said earlier that, God moves in mysterious ways, and I had other dreams. One dream was that Huzoor was sitting on a throne, even though he was a far distance away from me, I could see his face was glowing. A man came up to me and said that Huzoor will speak to anyone, anywhere, anytime, day or night. Another dream I had was that Huzoor was laying on his right side in bed and he held the sheet up with his left hand and asked me to get in the bed and lay with him. After these dreams I thought again about what I should do. Dr Khan, Mrs Khan, my husband Bilal and I went to London. We arrived on the Friday evening and after something to eat, we retired for the night. I had a dream that my father was seriously ill in hospital and my mother and brother were by his bedside crying. I was also crying but I told them that I was very sorry and that I had to leave. This was something that I would never have done. The dream upset me so much that I woke up crying. When I went down for breakfast the next day, Mrs Khan asked me what was the matter, as my eyes were red. I told her about my dream. Later that day we went to see Huzoor. I knew before I had even finished the Holy Qur’an that I was going to convert. When I completed reading the Holy Qur’an I decided to convert. Because Mrs Khan had cancer and by this time, Mrs Khan was too ill to travel to London; Mrs Khan’s children accompanied Bilal and myself to London. We went to see Huzoor. It was the 24th of July 1993. That morning Huzoor had been given a proof copy of the new Bai’at form that was now going to be used later that month at the 1st International Bai’at Ceremony at the Jalsa. He said I might as well use that one. He told me that he was not allowed to hold my hand, but Bilal could put his hand on Huzoor’s hand and I could put mine on top of Bilal’s. When we came out of Huzoor’s office, Tayyaba, Mrs Khan’s daughter said to me “I don’t know whether you realised, but Huzoor was wearing a white suit, as he was in your dream“. Because Dr. and Mrs Khan’s children were with us, it made me feel as though Dr and Mrs Khan were in the room with us also. Sometime later I started to learn Arabic by Mrs Khan, when she started to get a little bit better and also her sister in-law Mrs Tahira Sadiqa Nasira, who was also the second wife of the third Khalifa, and was also in England at the time and she also helped me. When I started to read the translation of the Holy Qur’an I saw that it also mentioned the prophets Adam, Noah, Moses and Jesus and all the prophets I had read in the Bible as a child and throughout my adult life. What also made me very happy was the Holy Qur’an mentioned Jesus as the son of Mary and that he died a natural death and was not taken up into heaven. As a Christian I always found this hard to accept that someone had to be treated cruelly and put on the cross and die so that all my sins could be forgiven. This was a relief for me because I always found this concept hard to believe. So this made me very happy after I converted to Ahmadiyyat to find out that the Holy Qur’an says that Jesus was a prophet and that he died a natural death and that the Promised Messiah said that he was buried in Kashmir, India. Although before converting, I believed that I was on the right path, but after I converted I felt as though I was on a more comfortable path now. I finished my first reading of the Holy Qur’an on the 31st of May 1995. That year Dr Khan held two of his children’s wedding in Hartlepool and Huzoor had come to attend the weddings. I had completed my reading of the Holy Qur’an in Arabic and Mrs Khan asked Huzoor if he would do our Ameen after the wedding. I was very nervous at the time, but Huzoor was very kind to us and afterwards he allowed us to have our photos taken with him. It is one of my most treasured possessions. Even on that day Huzoor was wearing a white suit. So once again a part of my dream had materialised. When I converted to Ahmadiyyat I made a promise to myself that I would do everything in my power to serve Ahmadiyyat in every way possible. After Mrs Khan passed away, another Pakistani lady become Sadr but after six months we had the elections again and I was made the Sadr and I stayed Sadr for six years. I have been in the Aamala and served in the best way possible. At the moment I am presently the Tabligh Secretary and I am also the Regional monitor for Tabligh. It always my intention when I go out to do Tabligh that I give the true image of Islam rather than the one that the media portrays. I have also been to Rabwah, Pakistan. I went for two weeks. There was another lady there from Sweden called Mrs Kanta and MTA Rabwah showed us around Rabwah. They showed us Schools, Hospitals and they were very kind to us. I really enjoyed my visit to Rabwah. My initials thought when I got to Rabwah were that how very kind and loving the people over there were. I already knew that the people of the Community were very kind because I knew Dr Khan and other families from the Community that lived in the Hartlepool, but people in Rabwah were just so welcoming and they wanted to tell you so much about the community. They told me how the community had started in Rabwah and the struggles they had to face in the beginning and how devoted they were. I have also been to Qadian, India where I was privileged to stay in the Promised Messiah’s may peace be upon him house. That was a great blessing. We were shown around where he would do all of his writing and the room in which he would pray. To me it was a proof of a miracle because the Promised Messiah had said that ‘his message would reach the corners of the world‘. Even though now Qadian is quite established and modern to what it used to be in the Promised Messiah’s may peace be upon him time, but still compared to the western world it is quite basic. It was a lovely experience for me to go to Qadian. To realise that there was no way that he was lying about his claim because a liar couldn’t claim that ‘my message will reach the corners of the world‘ as it has via MTA. The only thing I knew about Islam was what I had been taught at my school, which was mostly about the crusades. That infidels were killing holy men. That was my basic knowledge about Islam because I didn’t really know any Muslims personally. I hadn’t come in to contact with any Muslims who could teach me the true Islam. So the first people I did come in contact with were Dr Khan and his wife Mrs Sajida Khan. That was a blessing in itself because they practiced what they preached and preached what they practiced. They followed the teachings of the Holy Prophet, peace and blessings be upon him, and the Promised Messiah’s teachings and they followed Huzoor’s instructions. So this was an excellent way to be introduced into Islam. It’s just upsetting to see what the media and the Al-Qaeeda are portraying Islam as. This is presenting a real bad image of Islam. So this doesn’t give the west a good image of Islam at all. But overall my first impression of Islam was a good one. Ahmadiyyat has changed me as a person. One of the biggest changes that it has bought about in my life is that it has made me more at peace with myself. So converting to Ahmadiyyat has been a very big blessing to me. Over the years I have met many nice people and I have attended many Jalsa Salana and I get to meet other converts. I get to hear how they converted and what difficulties they had to face and how God helped them to get through it. I have even spoken to some people who have had dreams in which they have seen the Holy Prophet, peace and blessings be upon him. Ahmadiyyat is just a beautiful and loving community to belong to. Ahmadiyyat spiritually has made me much stronger in my belief. I’ve had three tragedies, the first was when Mrs Khan passed away, she was a very good friend to me and I loved her dearly. It just made me a stronger in my belief because I knew I would see her again. The second was when my brother passed away at the young age of thirty-three. My parents found this very difficult to accept this especially my father, who never believed that he would see him again. But for me, having my faith helped me get over that loss. The third was that my mother passed away after being involved in an fatal accident. Because my father was eleven years older than my mother he found it really hard cope without her. My father found it very difficult to accept that his loved ones had gone, but I firmly believe that I am going to see them again in the afterlife. My family’s reaction to my conversion to Islam was neutral. My mother was a very easy-going person she didn’t really mind what we done as long as we were happy and we didn’t harm anyone. But my father couldn’t understand why I had converted. He used to think that my husband had made me convert so he used to ask me whether he did made me convert. I used tell my father that my husband has never made me do anything I didn’t want to in all the time we have been married. My son couldn’t understand it either and he didn’t really want to know anything about Islam – he was very confused. Now he has children of his own. When I met my son’s wife she didn’t really want to know anything about Islam either and she didn’t want any of her future children to know about it. Over the years she has started to ask questions and every now and then we have a conversations about Islam. I am now blessed with two granddaughters and they and their mother have even started to occasionally come to events in the Mosque. When I converted I told my son that everybody has a soul and that everybody is accountable for his or her own soul and that you have to do what is right for your soul because at the end of the day you are going to be accountable for your own actions on the day of Judgement. Bilal and I pray that one day they will accept the true religion too and we believe that, Insha’Allah they will, together with my granddaughters and their progeny as well. I know that there is a God and this encourages you to think about your actions. I pray dearly that I can please Him and that I will eventually see Him and be at peace, Amen. 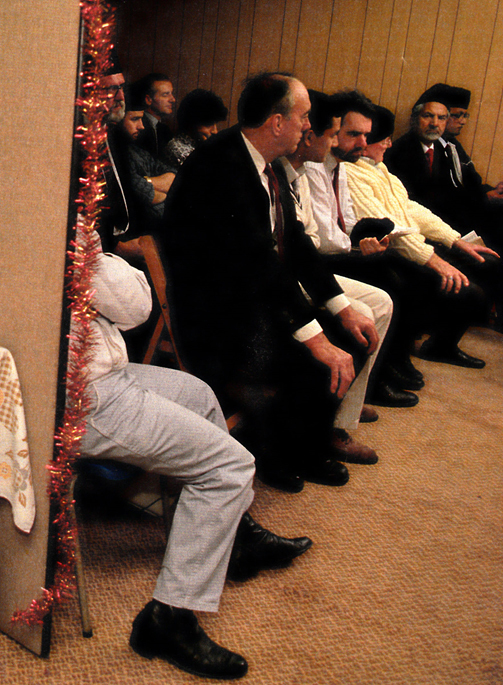 New Ahmadi Forum in Hartlepool 1990. The meetings were held at Dr Hameed Khan’s house and the men and women were separated by a partition.